The Rose Farm will open for the summer season on May 16, 2019! 12:00 p.m. to 4:00 p.m., through September 14, 2019. The Rose Farm is located 536 Holmes Lane, at the corner of Holmes Lane & Rilance Lane in Oregon City. To reach Holmes Lane, travel north approximately seven blocks from Warner Milne Rd. on either Molalla or Linn Ave.
For scheduled tours and Special Openings or for further information, please email McLoughlinMemorial@gmail.com. William and Louisa Holmes were pioneers who joined the ‘great migration‘ in 1843. More than 900 souls traveled the trail west that year. The Holmes family settled on a 640-acre land claim at the south edge of Oregon City. They lived in a log cabin with a view of Mt. Hood (42 miles east). Water came from a nearby spring, probably the source of Singer Creek, which empties into the Willamette River after cascading down the bluff near Main Street in Oregon City. Their home, completed in 1847, is the oldest American home in Oregon City and was the scene of early government meetings and many social events. The first territorial governor, Joseph Lane, gave his 1849 inaugural address from the balcony of the Rose Farm, and the celebrants gathered on the lawn below. The claim was nicknamed the ‘Rose Farm’ by friends and neighbors because of the many roses Louisa planted in the garden. 16: Celebration's - Oregon's 160th Birthday. National Historic Preservation Month Exhibit "The Preservation Legacy of Ruth McBride Powers". 18: Celebration of Holmes Family Events - William Holmes Birthday and Holmes' Anniversary - Holmes family leaves for Oregon - May 23, 1843. Presentations highlighting the journey over the Oregon Trail. 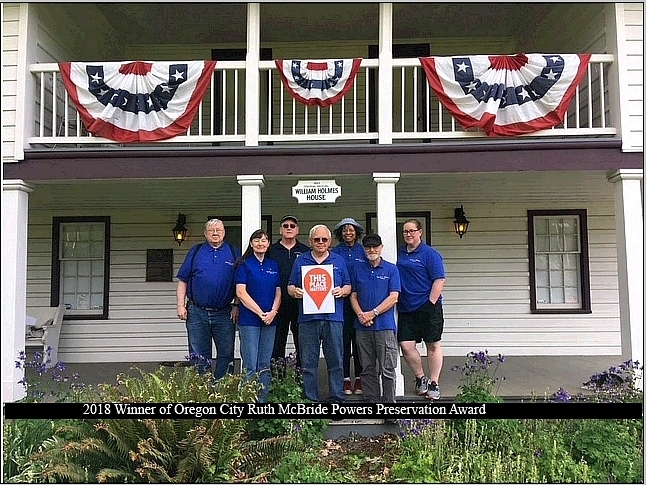 21-22: Oregon City Heritage Days - Celebrating William L. Holmes, Oregon's first Territorial Sheriff - Honoring Clackamas County's First Responders. Celebrating Oregon City's birthday. 6: Celebrating the United States 243rd Birthday - Period Firearms Display. 20: Family Arts and Crafts on the Lawn - Featuring works from local artist Ed Turpin. 10: Heritage Antiques & Uniques Sale on the lawn. 10: Plunder sale benefitting the McLoughlin Memorial Association - All day at 415 Jefferson St. Oregon City. 13-14: Holmes House Museum at the Rose Farm open for Oregon City's Neighborhood Associations. The Holmes House Museum at the Rose farm officially closes this weekend. Visit our Rose Farm Museum Facebook page! Come and see us, and enjoy Victorian Hints & Tips, Mystery Photos, and more!